Davy Select Website UX Design & Development by Communicraft. Communicraft worked closely with the Davy Select internal team to create a simple, intuitive web user experience to de-mystify the process of investing. The new, cross platform website resulted from a vigourous User Experience Design process, and Design Factory – a design partner of Communicraft, created a visual design concept and aesthetic based on a structure and user experience flow Communicraft's UX group designed with a team from Davy. The web development team at Communicraft then brought these designs to life in developing the cross device, responsive user interfaces that provided the functional user experience. "The web development team at Communicraft then brought these designs to life in developing the cross device, responsive and adaptive user interfaces that provided the functional user experience". Davy Select is a division of J&E Davy (trading as Davy). Davy is Ireland’s leading provider of investment, wealth management and financial advisory services. 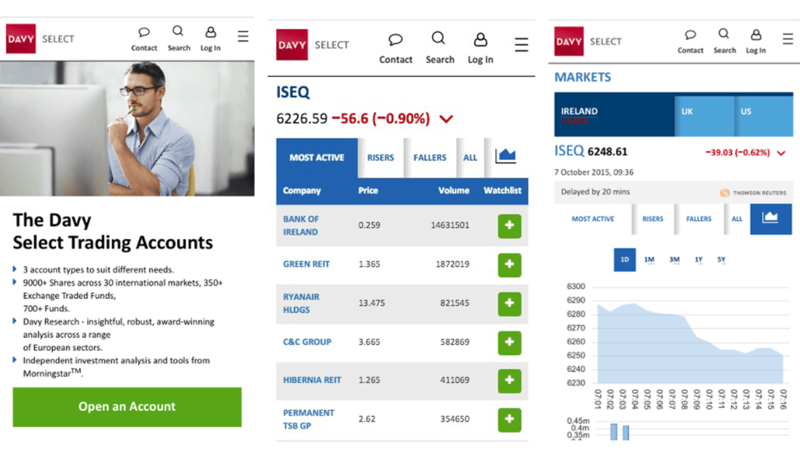 Davy Select is designed for investors who are comfortable making their own investment decisions, without financial advice. We selected Communicraft on the basis of their long standing track record, the clarity of their proposal, the insights they offered and their realistic estimation of the projects requirements as well as their clear knowledge of how the IT department of large organisations operate..